Hard to believe that Pinelands Barb & I only have one more section(# 10) to go, plus the fence section, # 13. We did do section 11 & 12 out of order so now it's back to the schoolhouse. I have the fabric picked for the schoolhouse, I think...it's so hard to chose when you want to stay with the stash & not go out to buy new fabric for a specific part on this quilt. I have to admit, a few times I did do that. But only a few times. 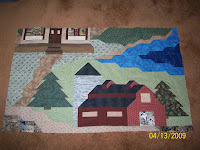 I bought the fabric for the cow in the barn & the General store windows. That barn is popping out of the fabric, even more so in person!